Find all info you need about every rooftop. Opening hours, dress code, pictures, maps and much more. 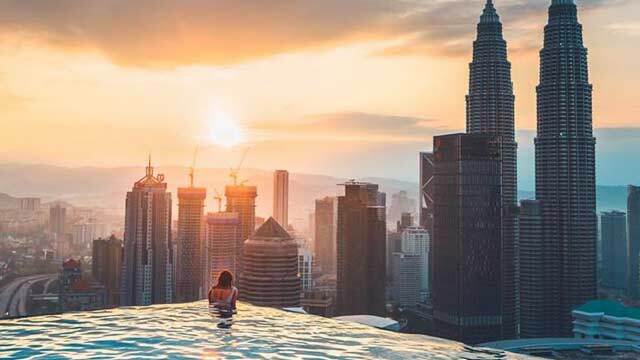 A large number of skyscrapers, summer all year long, fancy hotels and spectacular rooftop infinity pools makes Kuala Lumpur one of the best rooftop cities in the whole world. 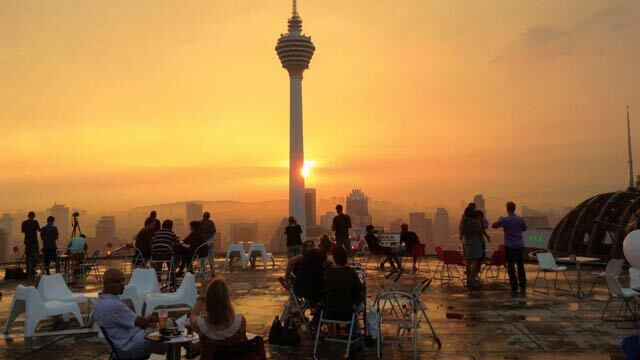 So, which is the best rooftop bar in Kuala Lumpur? You can find something for everyone here. And did we mention that the restaurants here are superb as well? 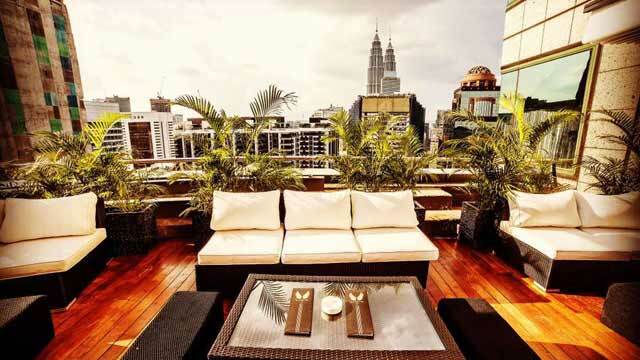 Look down and find the Kuala Lumpur rooftop bar best suited for you. Or use the Kuala Lumpur rooftop map in the bottom right corner. 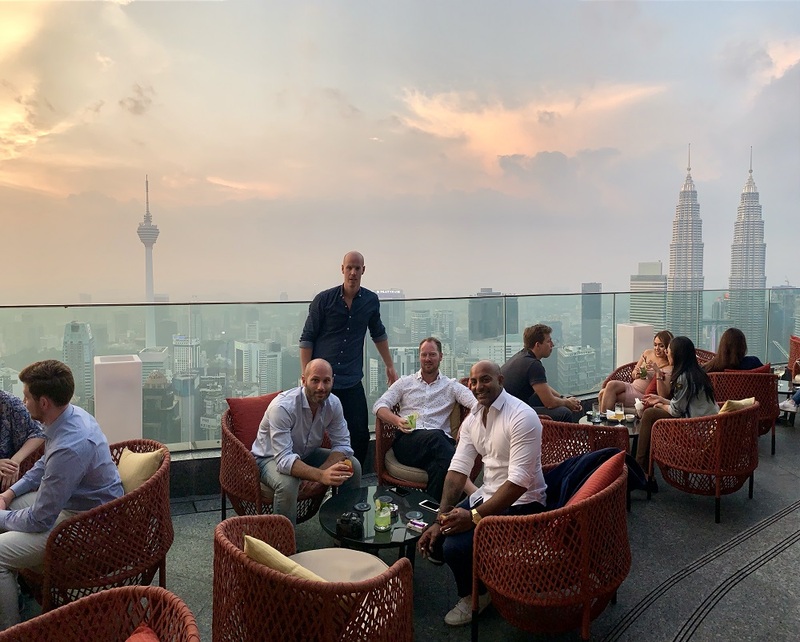 Somewhat of a rooftop and food-lover heaven, with 5 different rooftop restaurants and bars all at the same place, in the heart of KL and just a short walk from the Petronas Towers. 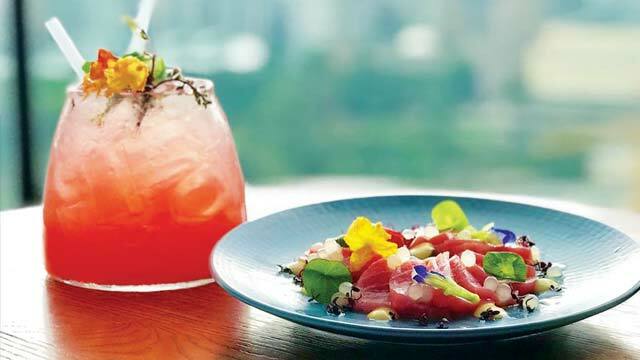 The restaurant with the best terrace and view is called Fuego, a South American restaurant aiming to offer new tastes and a fun and festive atmosphere. The food is mainly tapas and the cocktails are well made classics with a new twist. At the colorful terrace there is a great vibe and the views you get over the skyline and the Petrona Towers are just amazing. A fantastic rooftop bar, but also an upscale Italian restaurant and a whiskey lounge. 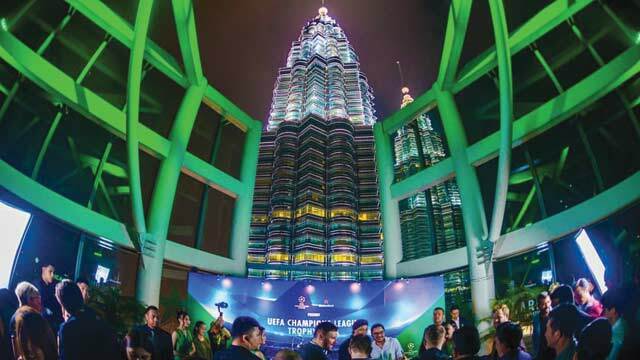 All located on the 57th floor of the Petronas Tower 3, where you get some really magical panoramic views of the city skyline, and even cooler up close views of the famous Petronas Towers. 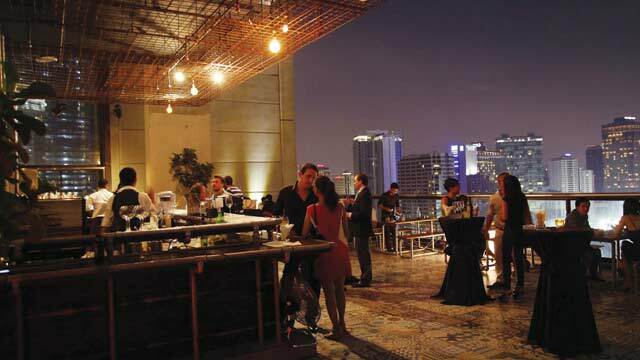 The rooftop bar is a luxurious and trendy spot that usually comes with a festive mood along with signature cocktails made by award-winning mixologists and a wide range of Italian bar bites and pizzas. Sunset hour between 5-9pm every night, with favorable prices on drinks. 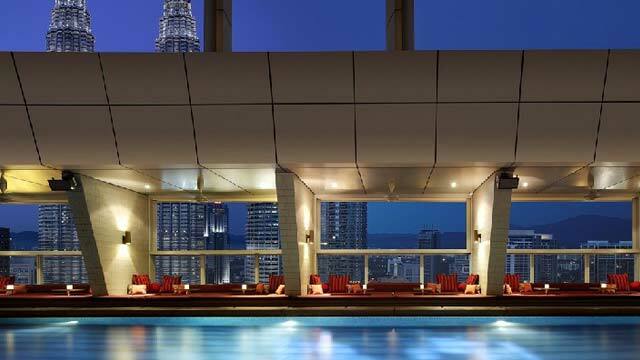 A glamorous cocktail bar where you find one of the most famous Kuala Lumpur rooftop pools. 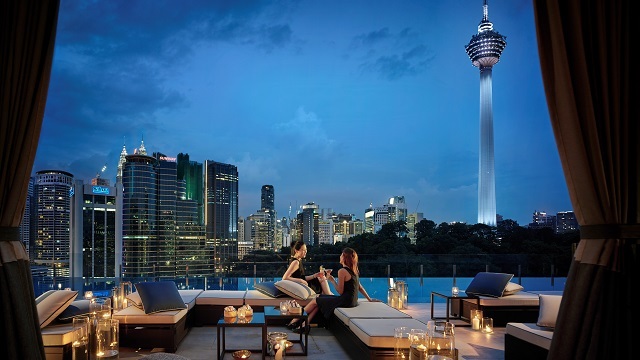 While the pool is only open to guests at the Traders Hotel, everyone can visit the SkyBar and enjoy magical views, fabulous cocktails and a festive atmosphere. 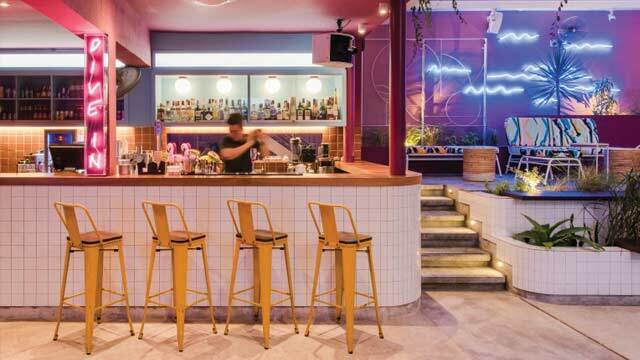 The rooftop bar serves a good range of beer, wines and some really tasty signature cocktails along with both international and local inspired tapas and some pizzas. Open throughout the day, so perfect for both relaxing afternoon cocktails and more nightclub-vibes later at night, with great music from live DJs and a vibrant but still relaxed atmosphere. 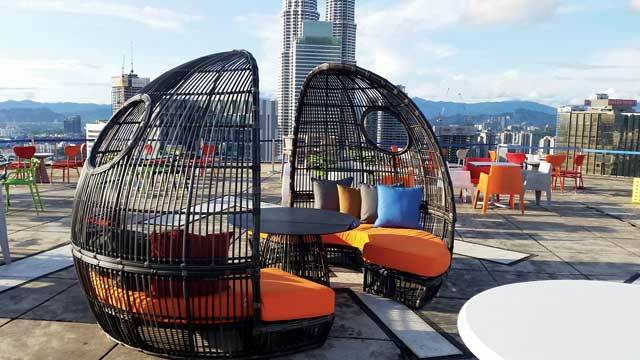 A quite new and exciting neighbourhood nook-inspired rooftop bar, offering a low key and soft vibe combined with breathtaking skyline views of the Kuala Lumpur skyline, where the city park and famous KL Tower work as a mighty backdrop. Very stylish and airy terrace, and the fact that the rooftop bar is only open three nights a week helps giving an extra exclusive edge. 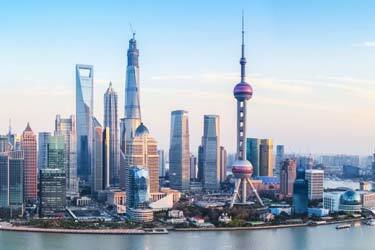 Here you can enjoy crafted Tsingtao (Chinese beer) themed cocktails and Man Tao buns perfect to share. 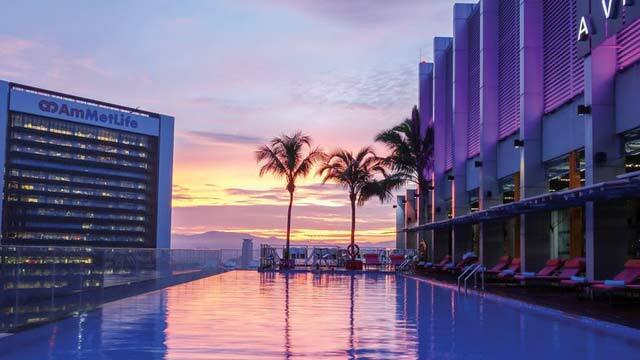 And, if you stay at the hotel, the big and absolutely amazing rooftop infinity pool. Elysium Bar & Terrace is closed at this location, new location will be announced. 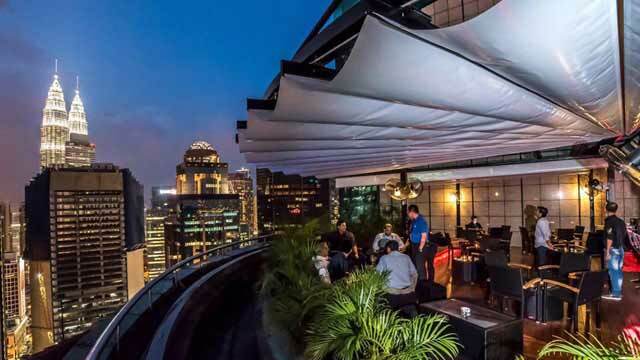 A trendy rooftop bar in Kuala Lumpur, located right in the heart of the city. 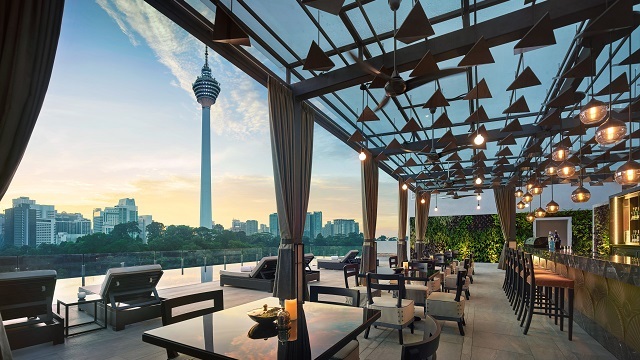 Elysium Bar & Terrace boasts both an indoor main bar and one floor below, a wooden terrace with stunning views over KL's most iconic landmarks. The terrace is equipped with comfy lounge sofas and some grenery, and also comes with a retractable roof for the rainy days. 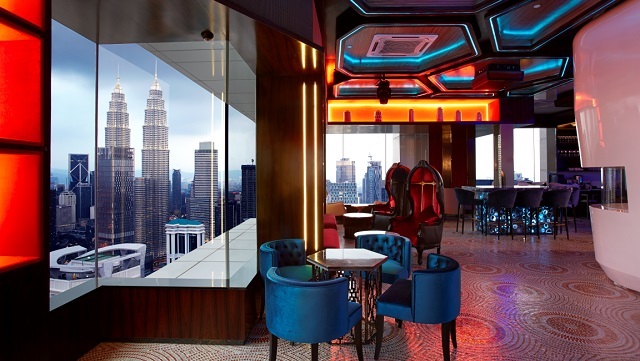 Here you can enjoy nice signature cocktails to the views of the Kuala Lumpur skyline. 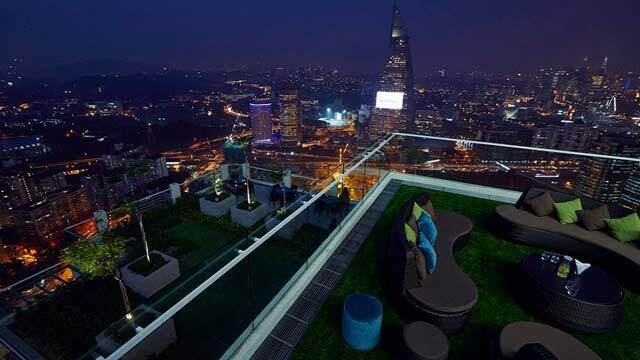 One of the coolest rooftop terrces throughout Kuala Lumpur, located in the south part of the city. 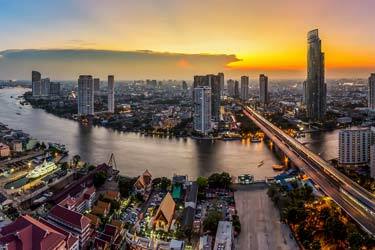 Up here you find an infinity pool, private rooftop jacuzzis, lounge furniture, a roof garden, a great bar, sun loungers and 360-degree views of the entire city. 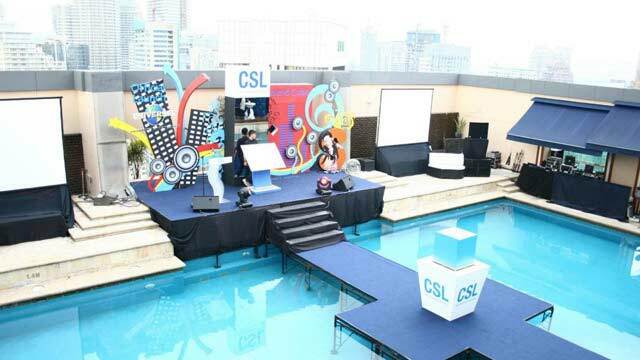 For a complete rooftop experience, with rooftop pool and all, you should book your stay at Capri by Fraser. 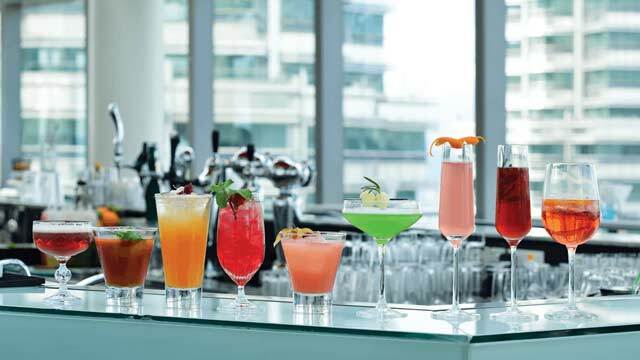 Otherwise you can visit the the U-Bar @Level 33, open daily and offering speciality cocktails, daily happy hours, Thursday dance nights and a panoramic skyline view in a relaxed and sophisticated atmosphere. 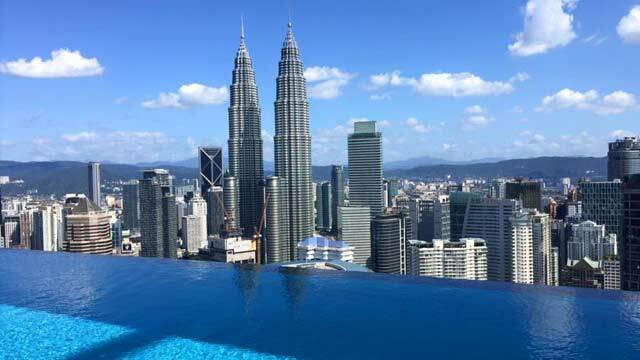 Take a dive into our list of the very best rooftop pools in Kuala Lumpur. 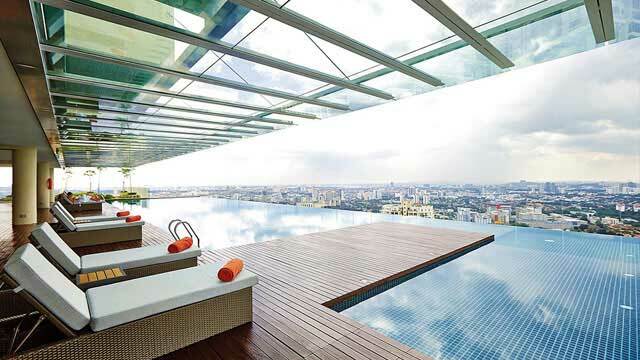 Amazing swimming pools with dazzling city views. 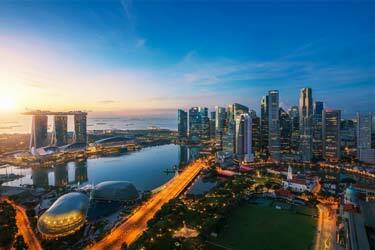 Don't miss out on this when visiting Kuala Lumpur! The FACE Suites offers a really fantastic roof terrace. 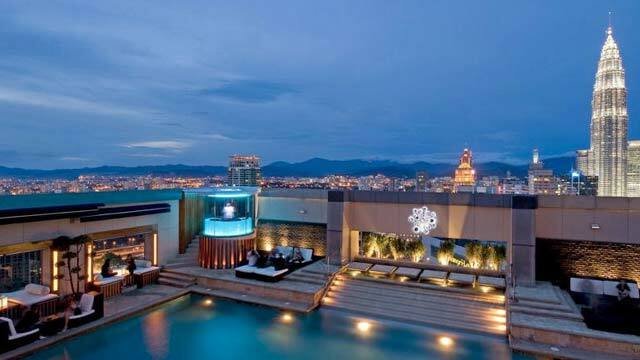 Up on the 51st floor of the hotel you do not only find a 38m wide infinity rooftop pool, but also a cool rooftop bar called Deep Blue, and a fine dining rooftop restaurant called Tangerine. 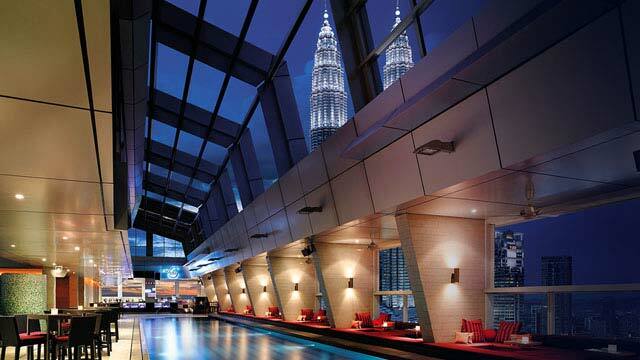 All with incomparable panoramic views of the entire Kuala Lumpur, including Petronas Twin Towers and the KL Tower. 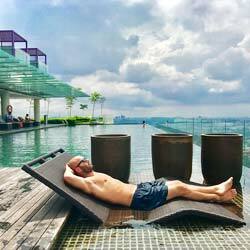 For swiming in the amazing rooftop pool you have to stay at the hotel, but otherwise the rooftop bar and the restaurant is open for all to enjoy lunch, afternoon cocktails, modern western fine dining or late night vibes with live DJs and a trendy crowd. 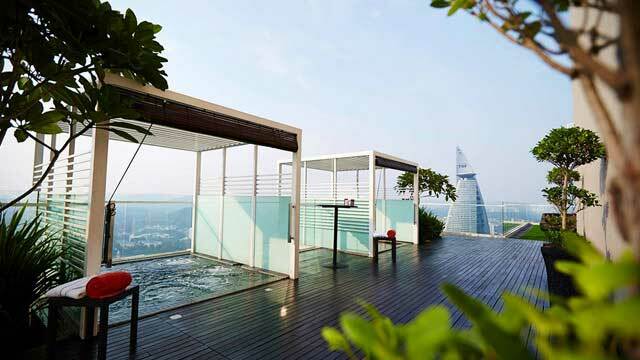 A three part rooftop on the 29th floor of the G Tower Hotel in Kuala Lumpur. Inside you find a Champagne Room and Whiskey Lounge, and then the best part is the airy terrace Al Fresco Bar. 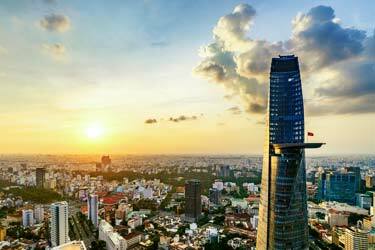 From here you get some superb views of the skyline with the Twin Towers as a magnificent backdrop. The wood decked terrace offers both bar stool and lounge sofa seatings right next to the edge, opening up for a cool and staggering experience. From the bar you can order the classics of wine, beer and spirits, along with creative and innovative cocktails. Popular spot for both after work and late night festivities. 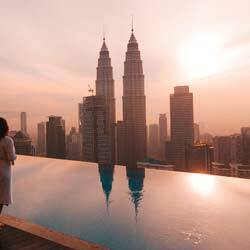 Check this out if you love to spend a day in a private rooftop jacuzzi or a rooftop infinity pool overlooking the rooftops in Kuala Lumpur. All at the luxurious hotel Capri by Fraser. 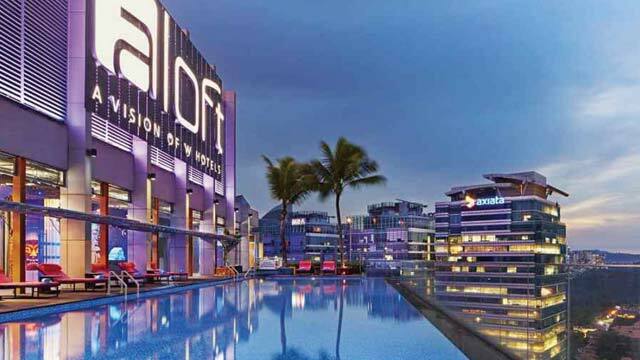 A swanky Tiki-themed rooftop bar situated on the 30th floor at Aloft Kuala Lumpur Sentral. An inside lounge with a very long bar is complemented with an outdoor terrace, neighbor with the rooftop pool, offering stunning panoramic views of the skyline and as far as the eye can see. The rooftop bar offers a wide array of cretaive cocktails, beers, wine and gourmet tapas, and every Thur-Fri is also 'Oh, Mai Bar-Becue!'. 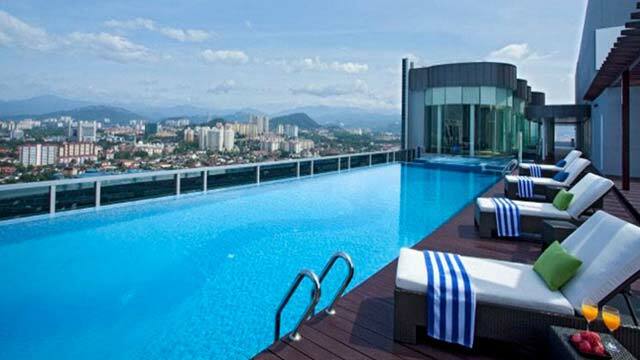 Known for its great ambience and relaxed atmosphere, and also for boasting with one of Kuala Lumpurs best rooftop pools. 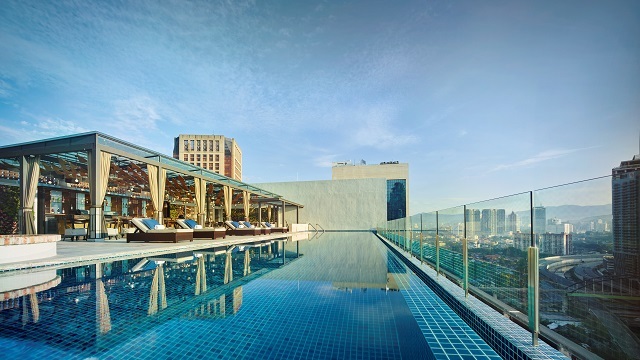 A lovely rooftop and pool bar, located at the 11th floor of the boutique hotel The KL Journal. 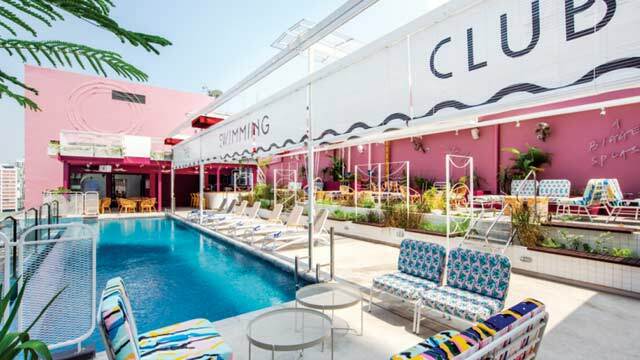 After a complepte re-styling of the terrace, The Swimming Club opened up in September 2018, boasting a colorful terrace with the design being almost as exciting as the fabouls KL view. 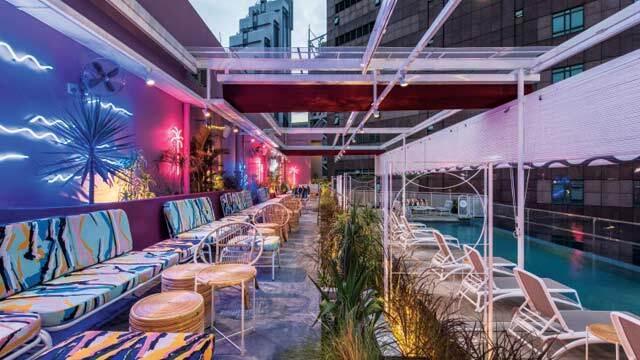 Located in the Bukit Bintang area, the rooftop bar offers fresh and well made signature cocktails along with tasty bar bites. On top of that, there is also a magnificent salt water infinity pool. If you are looking for certain 360-views and a completely open and airy terrace, this is the place! 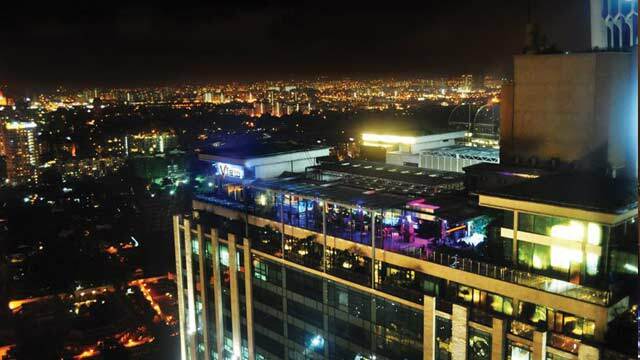 Just as the name suggests, Heli Lounge Bar is a big helipad made into a rooftop bar. Up here you have a magical 360 degree view of the entire city. Nothing for people with fear of heights, as there are no rail or walls, just you and all of the city at your feet. From the 34th floor indoor lounge a couple of stairs take you up to the quite low key and simply decorated terrace. Visit for a drink around sunset and you are almost guaranteed to have a memory for life. 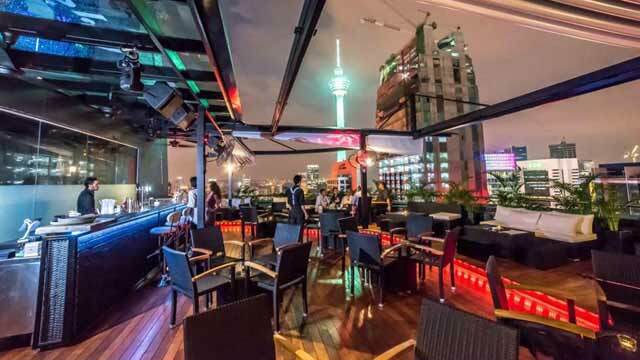 Classic rooftop bar in Kuala Lumpur, known as one of the city's best nightclubs and also the home to one of the most popular rooftop pools KL has to offer. The pool is open daily to guests at the hotel, but sometimes also at night, when everyone are welcome to various pool parties. The rooftop serves all the classics in terms of drinks, but are mostly praised for their very tasty cocktails. There is also a set of international bar bites available. 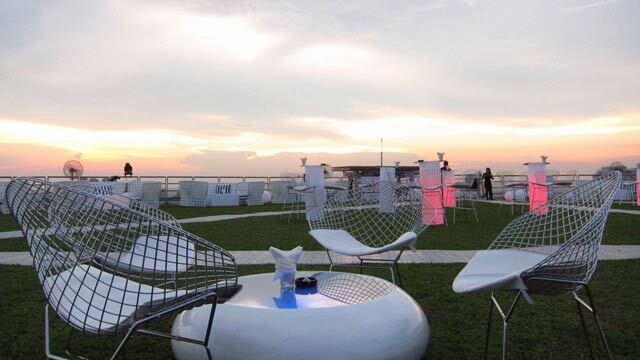 Visit Luna rooftop bar around sunset for a more relaxing atmosphere enjoying the magical 360-degree views and later at night to catch the party vibe, with a mix of tourists and locals enjoying live DJs. 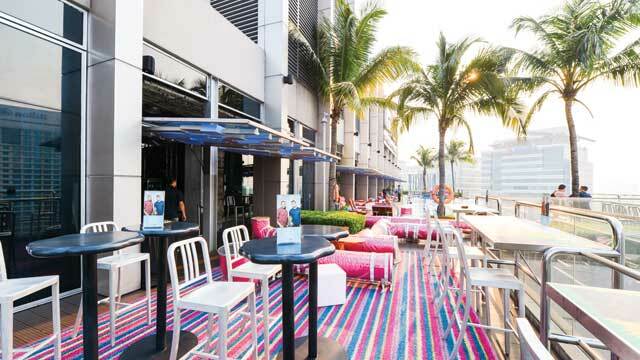 Asia's first lawn rooftop champagne bar, situated in Petaling Jaya in the outskirts of Kuala Lumpur. 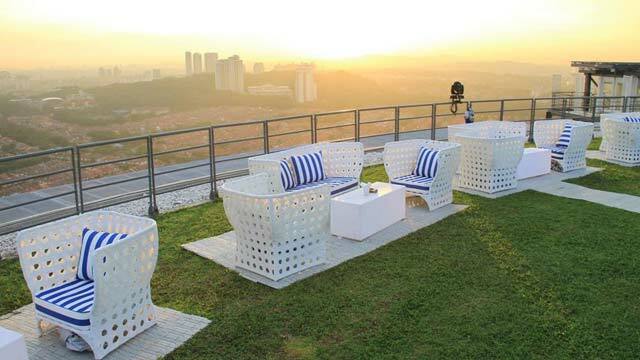 From here you get a magnificent view of the city and all of Klang Valley, with 360-degree views from everywhere on the open and airy terrace. With soft, stylish lightning there is really a sense of being "up in the sky". The bar serves all the classics of cocktails, champagnes, beers, and spirits along with International bar bites. 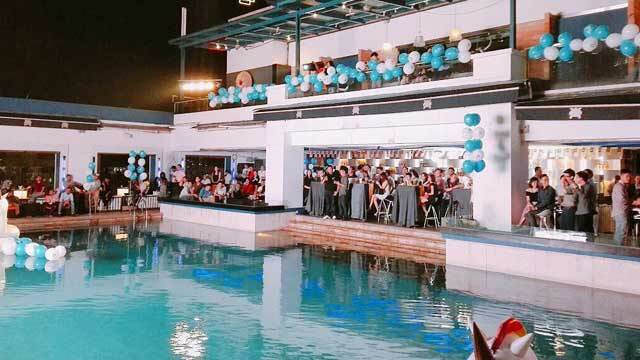 Stratosphere also host a number of different events, like rooftop cinema, sport-showings and romantic dinner sessions. 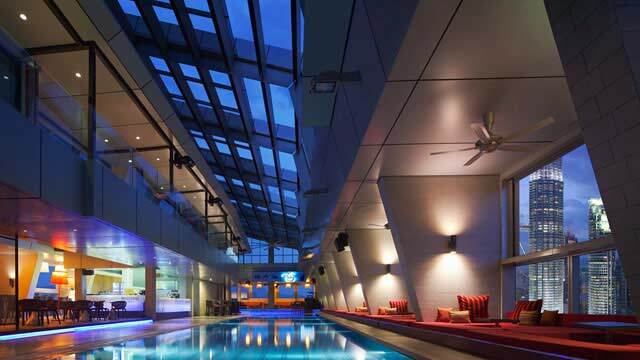 A luxurious apartment hotel with a large and luxurious rooftop pool. 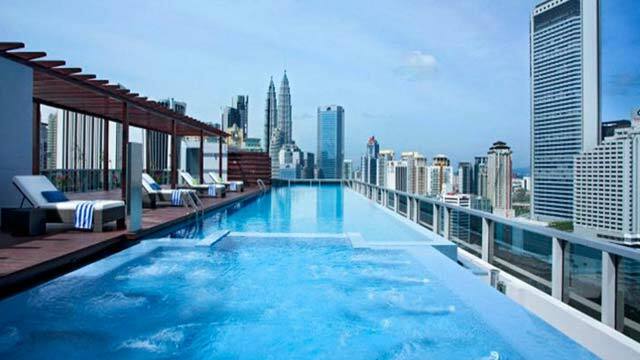 The rooftop terrace is only open to hotel guests, so if you want to enjoy one of Malaysia's coolest rooftop swimming pools, then you should book a room at the Somerset Ampang Kuala Lumpur. The terrace is also equipped with jacuzzis and various sun loungers that you can ejoy in privacy while gazing out over the amazing skyline view on display. 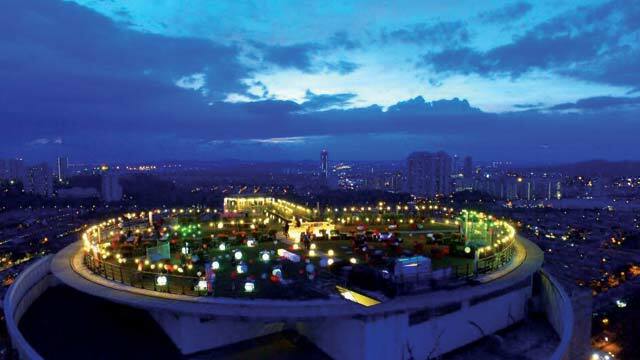 Discover the biggest collection of Kuala Lumpur activities, guided tours and skip-the-line tickets. Anything you want you'll find right here. 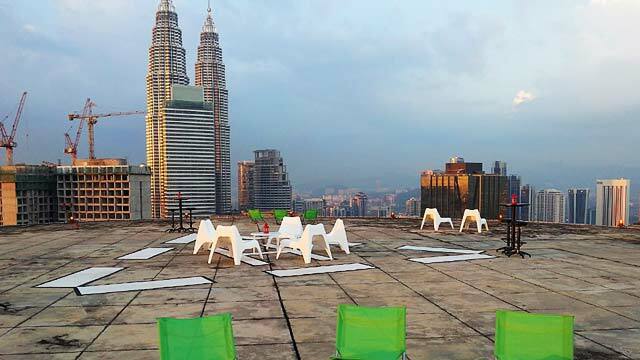 Which are the best rooftops in Kuala Lumpur? Kuala Lumpur is a city of many high-rise buildings, wich results in lots of fantastic rooftop bars with absolutely stunning views. 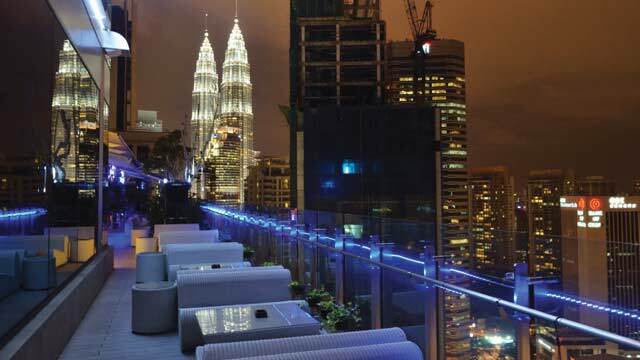 The rooftop bars in KL are often large and luxurious, with the view being the best entertainment. 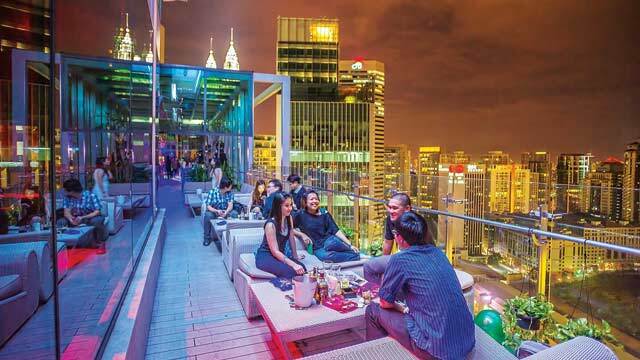 Most of the rooftop bars in Kuala Lumpur are also situated at hotels or restaurants. 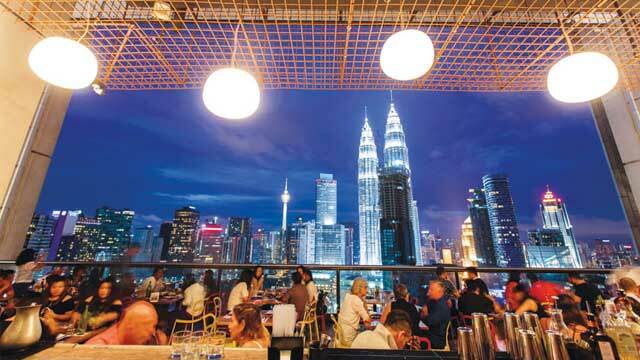 If you like magnificient city views, you should visit a rooftop bar in Kauala Lumpur. Or why not visit man rooftops while here. 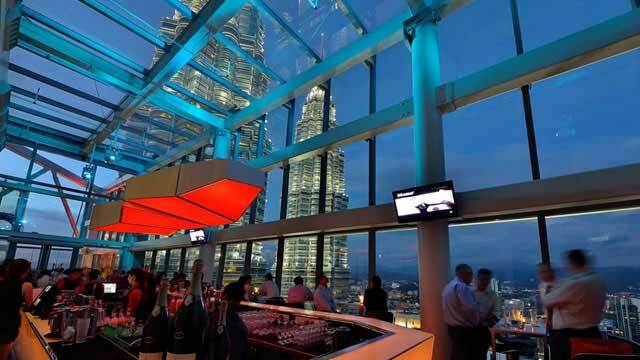 The rooftop bars in KL holds very high quality - both regarding service and grand views over the city skyline. Kuala Lumpur is Malaysia's capital and the country's largest. 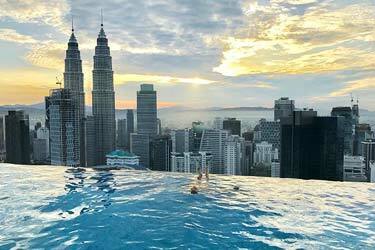 The name Kuala Lumpur means "muddy confluence" which originates from the city being founded just by the muddy rivers that floated together right in the area. The climate here is warm all year round, with a fairly moist air. On average, it rains about 200 days/year. 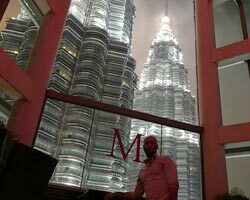 As a tourist, it is mainly the buildings in the city that attracts, foremost the famous Petronas Twin Towers and Kuala Lumpur Tower.